Can you feel it? The air’s a little warmer, the days are a little longer, and buds and blossom are starting to pop up everywhere you look. Finally, the depths of winter is over and spring is beginning to show its head. I don’t know about you, but I have a little extra spring in my step this week. The relentless rain seems to have passed and I don’t have to bundle up when I step outdoors. I’ve spotted cherry trees, magnolias and rhododendron bushes all flowering. The landscape outside my window looks that little bit greener. We weren’t settled in our house last spring. We were in limbo, staying between friends and family, a few nights in the countryside and a few nights in the city. This will be my first proper spring living here. I’m paying close attention to where the blossom trees are, keeping my ears open for talk of where I’ll find a bluebell woods, and diverting all my walks to pass fields full of lambs. I love this time of year, when everything wakes up, and am relishing my first spring living in the countryside. Perhaps you already knew, but today is the Spring Equinox. Or, more precisely, the Equinox will occur at 21.58 this evening. This is the time when the sun crosses the celestial equator. It is the mid-way point between mid-winter and mid-summer, and is one of the only two times of the year (the other being the Autumn Equinox) when the hours of day and night are almost completely equal. It’s a turning point, when we can finally turn our backs on winter and start to relish the days becoming longer than the nights. This is often a time that I spend planning. Spurred on by the change in the seasons, the beginning of spring inspires me to make plans for the next six months. It’s easy to see the summer opening up in front of you, filled with long lazy, hazy days. All I want to do during the spring and summer months is spend as much time outdoors as possible; wild swimming, meals outdoors, and plenty of travelling. The hills outside my window are beckoning, and I’m counting down the days until it will be warm enough to visit my favourite swimming spots from last year - and perhaps discover a couple more. 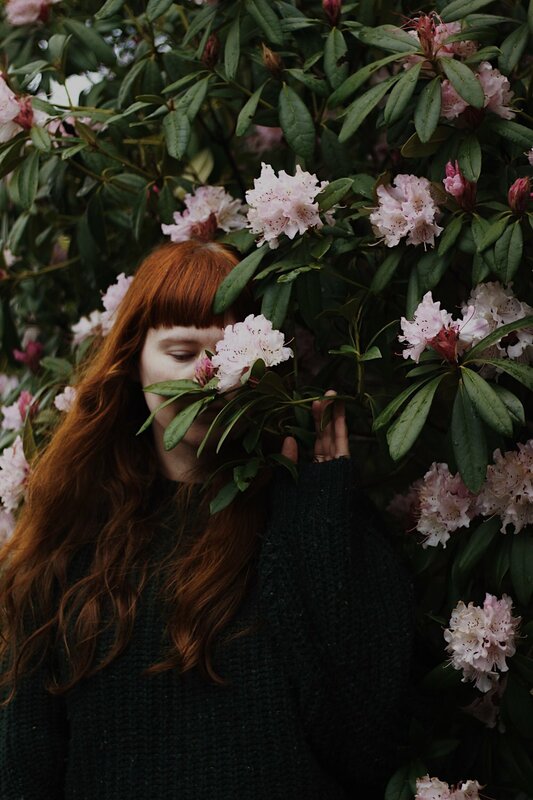 I always feel incredibly inspired to take photographs at this time of year, and while my boyfriend helped me to take the portraits in this blog post, I’m planning on launching myself into more flower-covered bushes to refine my self-portrait skills this spring. There are so many beautiful landscapes surrounding where we live, and I can’t wait until everything turns green. If you follow me on Instagram, you’ve probably noticed spring hues of pink and green taking over my feed. As this is our first full year here in our new home, I want to start new traditions. I’m planning on taking myself for more solo walks, probably with a book so I can sit and read outdoors. I’ll be making the most out of my evenings to go swimming, walk up a hill, eat a picnic tea outdoors or just to sit in the garden with a glass of wine. We moved here to be closer to nature, and what better way to embrace it than to spend as much time outdoors as possible. There are other things I’m looking forward to this spring. Exploring Sweden for the first time, taking a slow road trip around Cornwall, attending more outdoor feasts, taking on more photography jobs, and planting our garden with more fruit and vegetables. We have a few projects we will be working on, including hopefully transforming our garage into another room/Dave’s workshop and adding a wooden deck to the front of our house. I’d like to find new clients to write for, and maybe even start work on that book I’ve always wanted to write. It’s the time of year when I feel like anything is possible!